Joan Bellec and Fiona Roberston at the Centre for Applied Linguistics of the University de Franche Compte (Besançon, France) organise the first Aviation English Forum, primarily for teachers. Over the years this event has evolved to encompass all aspects of the training, testing and use of English in aviation. From these early beginnings, ICAEA was born. The Association was formally registered in Paris, as the International Aviation English Association (IAEA) – a non-profit making association – governed by French law. The name of the Association was changed to the International Civil Aviation English Association (ICAEA). The statutes of the Association were revised so that a Bureau of Office Bearers could be introduced. An extraordinary meeting of the Association decided that the Bureau of Office Bearers would be extended to 6 persons including 3 new Vice-Presidents. ICAO Circular 323 – Guidelines for Aviation English Training Programmes is published. Co-written by ICAEA and ICAO, this document sets out guidance and best practices by which aviation English training programs can be designed, delivered, staffed, managed and assessed for appropriacy, efficiency and cost-effectiveness. ICAO 2nd Rated Speech Samples Training Aid (RSSTA) is published. harmonisation of rating standards between test service providers. The ICAEA Board now consists of 6 Office Bearers and 9 Board Members. 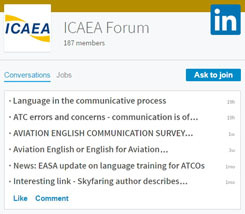 ICAEA establishes a new Research Group (ICAEA-RG) composed of Members of the Association who are currently involved in academic research into English language usage in aeronautical communications. ICAEA’s Membership continues to grow and now represents Aviation English interests in more than 75 countries worldwide. Members include Aviation English language trainers, examiners and raters, test and training materials developers, pilots, air traffic controllers, cabin crew, aircraft maintenance, regulators and other aviation professionals.